Since Childhood, Holly Addi has had an affinity for all things creative. Addi has an abstract style of painting that cannot be defined, but rather Ǯfelt.ǯ She grew up with a mother who was an interior designer and a father who was a creative entrepreneur. 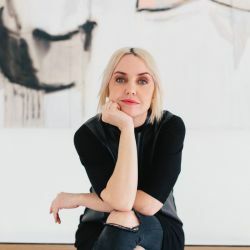 She received her BFA from the University of Utah, and spent the early years of her career mastering floral artistry and as a creative director for lifestyle brands but her true passion has always come back to her art. She has mastered her art style through her love for composition, color, and the philosophy that through lifeǯs imperfections, there is always a need for beauty, especially in chaos. Holly paints full time in her studio in Salt Lake City with her two dogs Henri and Hugh, and travels for inspiration. She exhibits Internationally.